I had my very first bagpipe lesson today. 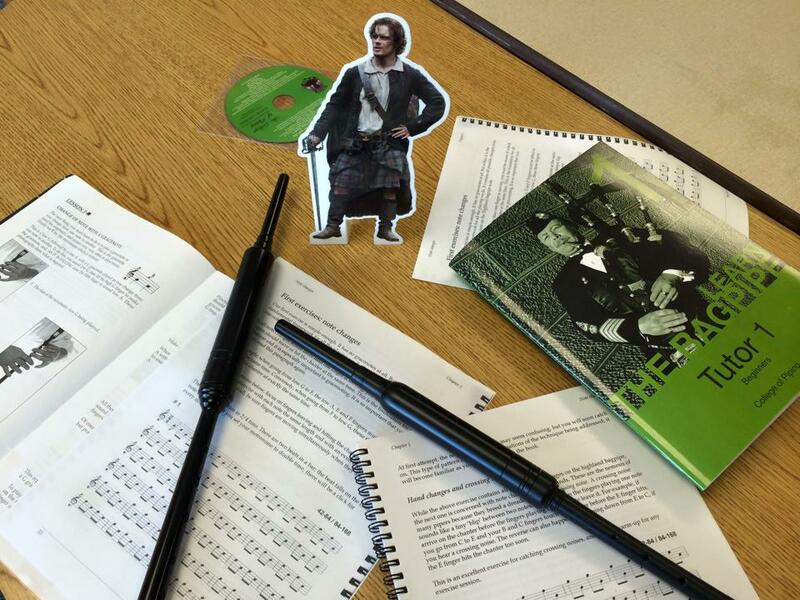 Well, sort of… I sat in with a fellow Outlander fan as she had her fourth lesson with the bagpipes. I figured I’m full of hot air, why not use my powers for good instead of evil? I played the trumpet (another lifetime ago) and still remember some of that training. Let me tell ya…bagpipes??? D i f f e r e n t ! ! ! I do not have my practice chanter or book yet, so I just sat and listened and took mental notes. I have wanted to learn the bagpipes for many years now and did not know where to look. The piping gods must have been looking out for me in the form of my friend, Carolyn. She started four weeks ago and thought I might be interested…uh, YEAH!! As I am watching, I am noticing finger placements, air flow, mouth movements, reed placement, and trying to pay attention to the correct tones. Even just by watching that one lesson I was able to learn a lot (YEAH, high school band!!) and was itching to give it a try. At the end of the lesson I met the leader of the band that was giving the lessons and ordered a chanter and book. Luckily, our instructor had an extra chanter and book so I could practice at home until my equipment comes in. Itchy, itchy fingers here we go!! At this point, I am still really excited and blew into the chanter at a stop light. WOO HOO sound!! 😀 I got home and as a diligent student practiced for an hour. Having *some* musical background I was fairly confident that I could make some decent notes come out. Oh confidence, how fickle you can be. I feel that my windflow is good, the problem I am having is that I can’t quite find hte holes correctly with my right hand. S T R E T C H those fingers! I am so determined to get this that I even taped my three right fingers to keep them straight to hit the holes. It helped a little, but untaped them after about 20 mins. There are nine notes we are learning and I’m pretty sure I have the fingers down for low G, A, and B. If I can get the fingers over the holes correctly, I will be in business! This is going to be an ‘interesting’ adventure I have placed upon myself. Let’s see how far this can go and if my fingers and thumb can take it. Ooooo, look! DRUMS! !